Once you turn off the main road onto the track you soon leave the tarmac and houses behind and find yourself rolling down into the heart of the farm. 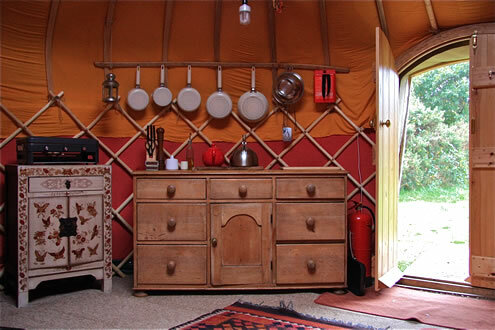 Arriving in the small car park, and after a phone call to Ti , you will be welcomed and shown to your yurt. All the yurts are an easy walk from the car, and there are wheel barrows for carrying bulky supplies. In the reception area there is a freezer( to keep ice packs cold, there are separate chill boxes in the yurts), and facilities for recharging phones etc.. There is also a washing machine (detergent supplied) and spin dryer. There is a small barbecue outside each yurt. 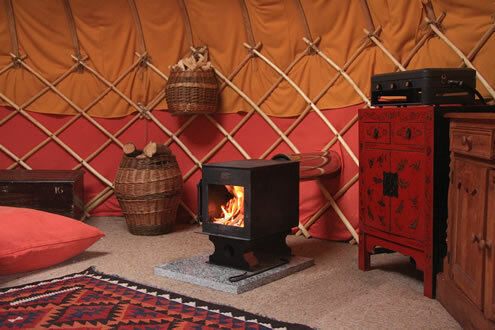 The wood burning stoves in all the yurts are set to one side. The stoves warm the yurts up in minutes and have flat tops good for cooking on or you can use the small gas cooker beside it. There are plenty of cooking utensils, pots and pans, and crocks and cutlery. Food storage in pine dressers and on shelves hanging from the trellis. There is a chill box in each yurt and facility for keeping ice packs cold. There are also barbecues with each yurt. There is an outside sink for washing up and there are washing up bowls with Ecover detergents, scourers, dishcloths and handtowels provided in each yurt. The 16ft Green Man has a double bed and room for a cot. The 18ft Oak Wood has one double bed and one double futon. 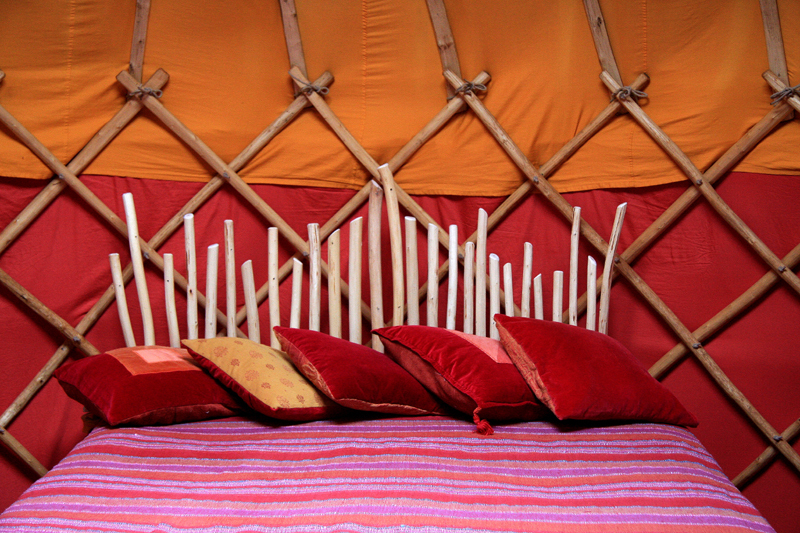 The 20ft Ash Field yurt and pod has one king size bed, one double futon, and one single futon. which serve as sofas during the day and beds at night. 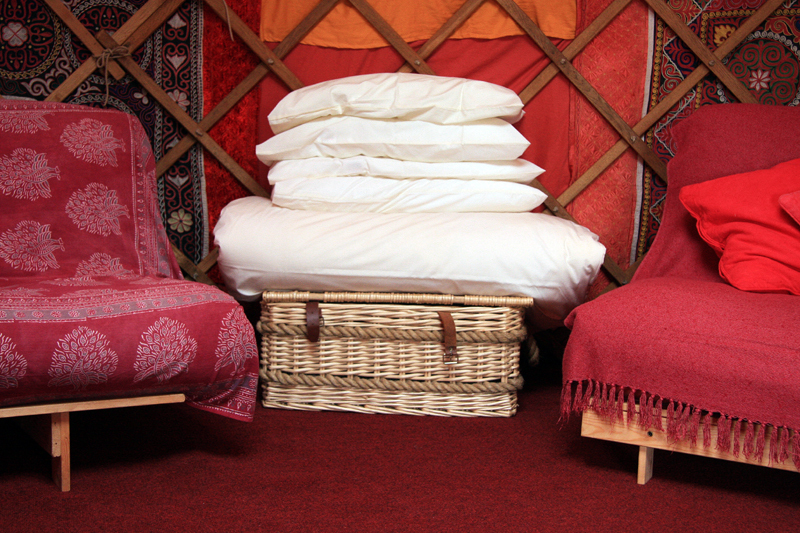 Extra blankets are available in each yurt.The 20ft Ash Field yurt also has a 10ft yurtpod attached to it. Fully felted it gives the kids their own insulated space and sleeping area (double futon) without being detached from the mother yurt. A travel cot can be supplied for no extra charge. Bed linen can be provided for £20 per double or £14 per single, includes duvet, sheet and 2 pillows (per person) or you can bring your own bedding. We use Ocean Breeze, a local linen service who use the latest green technology in their laundry. Bath towels can also be booked for £6pp. 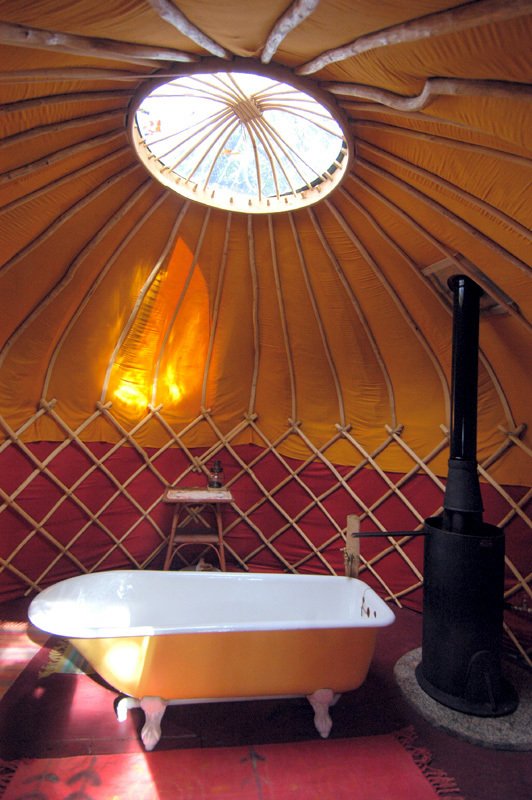 The bathroom yurt is a short stroll away from each yurt and is on a pine wooden base with rugs on the floor. The specially designed Coromandel wood burning water heater provides hot water straight into the roll top bath . It may take a little longer, but lying in the bath with the wood burner crackling away you can look up and see the trees and sky above you. 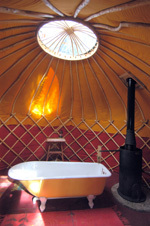 The bathroom yurt and the solar shower is shared between the three yurts. 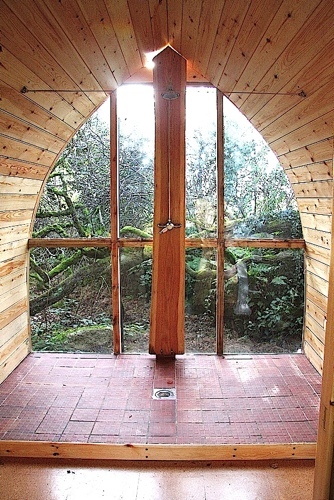 The solar shower is built in the same style as our ig-loos (see below). It is glazed on one side so while it is still totally private there is a great view out onto a hedgerow of moss, ferns and twisted hawthorn branches. Water is heated by the sun or by an immersion heater for days when the sun doesn't shine. Toilets: Each yurt has its own compost toilet nearby, housed in one our home designed Ig-loos with a big, beautiful beech wood seat. 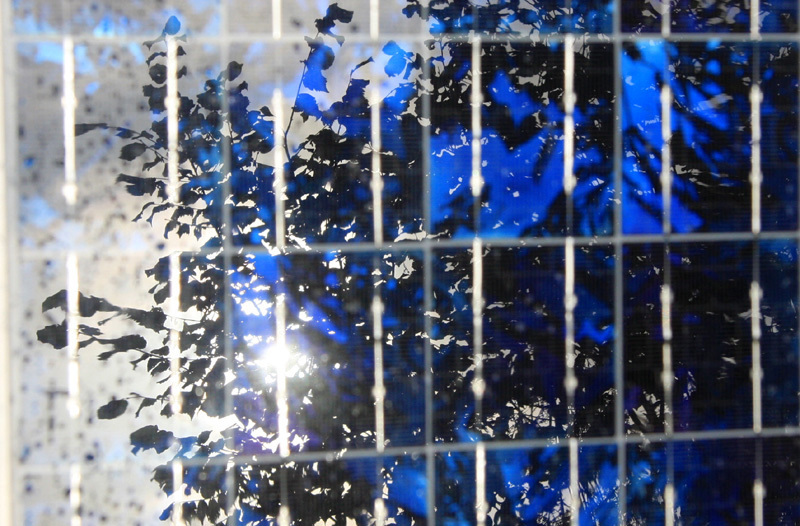 We have a solar photovoltaic panel for the 20ft Ash Field Yurt. It provides low level lighting but useful for the darker ends of the season and for preparing food in the evening. All of our yurts have outside fire pits adjacent to them. 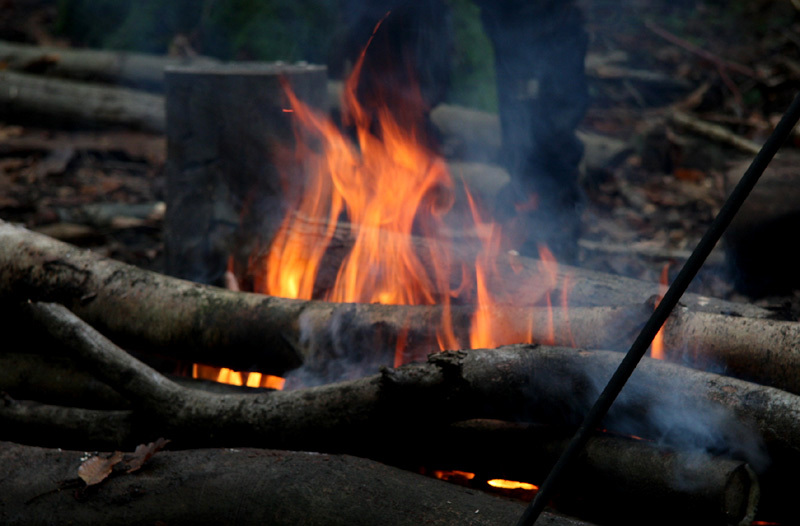 Campfires are encouraged and two big bags of firewood is supplied on arrival. 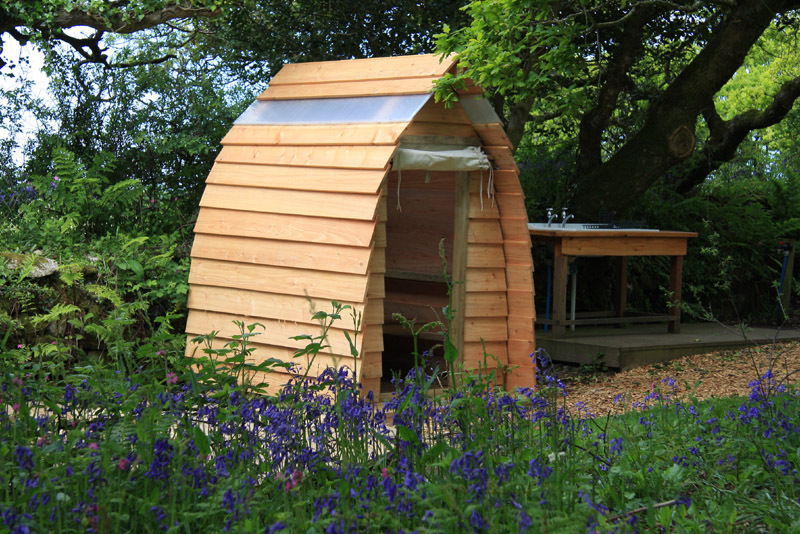 20ft Ash Field Yurt with 10ft Pod attached: One King size double bed, one double futon in the big yurt with one double futon in the pod. Plates, side plates, bowls. Also plastic plates , bowls, cups for children. Wooden spoons, ladle, fish slice, bread knife, 8" knife, 4" knife, scissors, cork screw. Matches, kindling and logs, fire guard, gauntlets and poker. First aid kit, fire extinguisher, fire blanket.